We all know that guest blogging, as a whole, isn’t dead. We also know that it’s a very effective form of brand building. And we know that we need to pitch guest blogging proposals in order to secure a guest post. But how do we actually do it? How do we create a guest blogging proposal that gets accepted? Everything you’re about to read is absolutely useless unless you follow this first point. You must -- absolutely must -- choose guest blogging sites carefully and intentionally. I’ve explained a thorough process of how to find spots for guest blogging on my own blog, and highlighted some of the key points below, too. There are two main reasons why you must understand the audience you want to reach. In order to create exceptional content, you must be able to provide value for your audience, which comes in the form of expertise, experience, humor, exclusive information, unique point of view, etc. For your own sake, you want to make sure you’re reaching the audience that’ll help build your thought leadership and drive real ROI. To do this, you need to make sure you understand exactly who your audience is and how they behave. 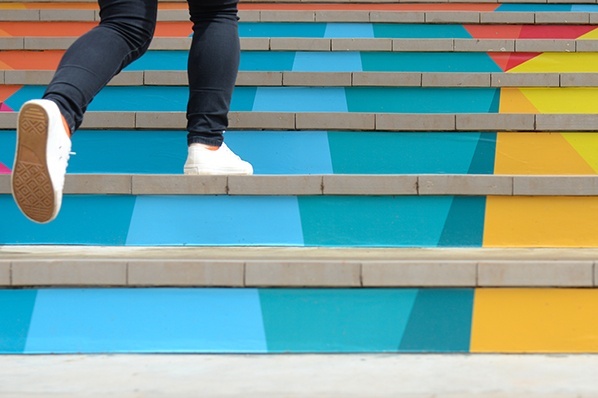 The best way to advance your guest blogging pursuit is to score a post with a single, top-notch site -- and to do that, you'll need a quality submission. Landing one quality guest post spot becomes like a trophy that you can show to other sites, signaling that you are a writer of solid reputation. 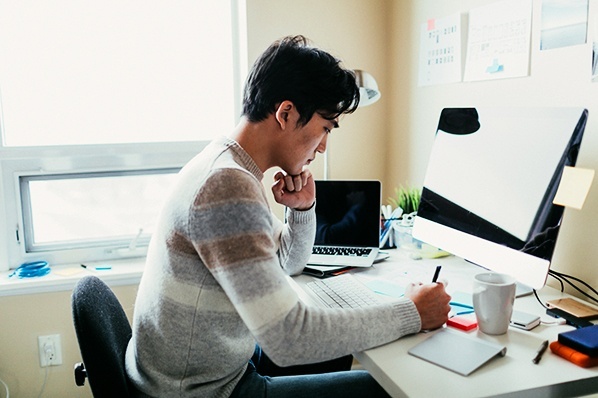 Earning that spot shows you’re serious about what you do and you’re good at it -- the qualities most editors are looking for in incoming writers. I recommend keeping your pitch as simple and straightforward as possible. Simply use email. Send a message to the site owners or editors using the submission form or whatever email address you can find. If you simply cannot use email, then you may be forced to second-best options such as LinkedIn, Twitter DMs, or Google+ messages. These shouldn’t be your first choice, though. Go directly to the best source -- email. 3) Use a professional subject line. Your subject line is your calling card. Your subject line will decide 1) if your email gets opened, and 2) how your email is received. Reading those, I hear an editor clicking the trash can and “mark as spam” button as fast as she possibly can. I’d like to submit my article to your site (attached). This direct subject line is a simple, declarative sentence. The approach works well, because it is very clear and short. Most editors trolling through their inbox will see it and quickly understand what's inside. The little word “attached” at the end may pique their curiosity enough to open the email. Request for guest posting. Article included. This subject line is a lot like the ones above. It puts forth the intent of the email, and mentions that the proposed article is attached. 4) Use a professional from line. Just as significant as the subject line is the “from” line. Most email programs are set up in such a way that you can see both the “From” line and the “Subject” line. It’s fairly obvious that a subject line is important. But keep in mind that your “from” line has just as much of an impact on whether or not your email gets read and/or accepted. 5) Use the recipient’s name if you can. If your email is going to an individual’s email address, then common courtesy is to address them by name. “Dear Sir or Madam” is superfluous. “To Whom It May Concern” is cold and impersonal. A simple and polite “Hi Jane” is just fine. Using the recipient’s name also strengthens your first line, which is critical. Many email programs (I’m looking at you, Gmail) show the first line of an email, even without opening the message. Often, I don’t even open email if the first line tells me that the email useless. I suspect that many site owners operate in the same way. 6) Tell them who you are. Start your email by stating who you are. This is not rude or arrogant. It’s polite. Think about it. You’re sending an email to a stranger. The least you can do is identify who you are. You should do this in one line or less. If your title is “Linkbuilding Specialist” or “SEO Promotions Manager,” I would go ahead and change your title to something more innocuous for the purposes of a guest blogging proposal -- editors might think you're solely in the guest posting game for link building. You can also link to your LinkedIn profile, a Twitter account, or another social network to help confirm you’re a real person. 7) Tell them why you matter. This next section is the most important line in your entire email. You have to matter. Somehow, someway, you need to validate yourself in the consideration of the site manager. Tell them other places for which you’ve written. 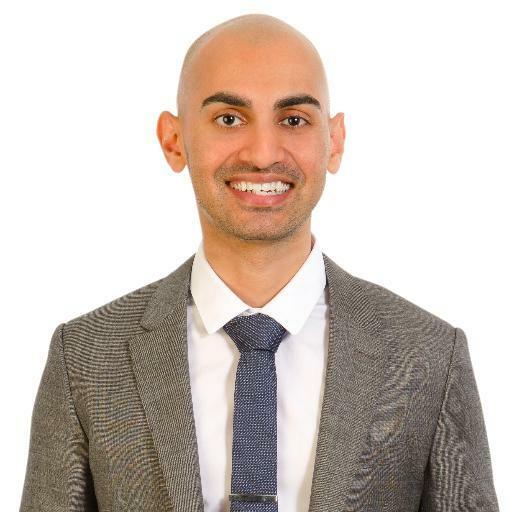 “I’m a regular contributor to Forbes, Inc., and HuffPo.” Be sure to provide links. Even if you aren’t a big deal, you need to sound kind of like you are. Don’t be deceptive, but don’t downplay yourself either. 8) Prove your position in their niche. Every website is about something, and you must make it very clear that you are well positioned within that website’s niche. If the website is about conversion optimization, then you need to be well-versed in conversion optimization. If the website is about personal finance, then you need to be a skilled credit recovery expert. If the website is about Mac rumors, then you need to be a former Apple executive. Go ahead and use buzzwords or jargon if it proves your point. My point is this: Each proposal must be crafted with laser-like precision to the site you’re pitching. Research the site, research the readership, analyze their content, read everything you can. Get a pulse on the most popular posts they’ve produced. Know the site, and use that knowledge to craft a more compelling, relevant pitch. 9) Give them your content. Website owners don’t have time for that. “If” is a word that transfers responsibility to them. Now they have to do something -- reply to your email, ask you for the article, etc. Either way, it puts them into an uncomfortable position. Guest blogging means that you’ve already done the work. You have an article, and you can send it to them. If the website has a good reputation, then don’t worry about your content getting stolen. And, in case you didn’t realize, you’re doing this for free. Payment isn’t an issue, so there’s very little risk in sending them your content. The only caveat is if you’re pitching a lot of sites for a guest blogging position. You don’t want to send the same piece of content to 20 sites and run the risk of several of them publishing it. That makes them look silly, and in turn will make them less likely to work with you in the future. 10) Link to a Google Doc. Tip: start a new blog post draft on your blog, write and edit your guest post on it, and then copy/paste your html version into .txt file. Once you’ve created the .txt file, delete the draft. 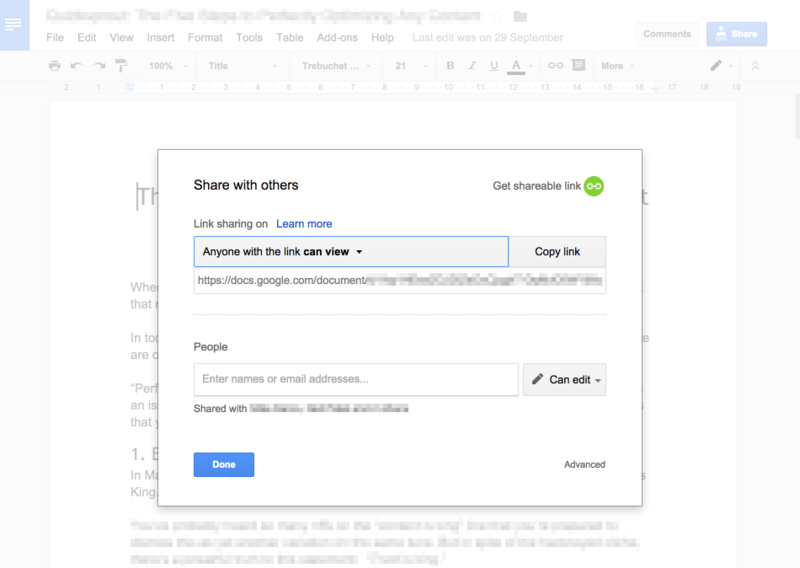 Here’s an easier way: Put your content in a Google Doc, and share it. You probably want to allow anyone with the link to view the content. (Yes, I know that they can still copy/paste it, so it’s not completely protected.) What I’ve found is that when an interesting article hits their radar, it gets sent around to scheduling assistants, editors, co-editors, managers, and other people who will touch the article before it hits publication. Rather than restrict the content to a specific email address, it’s okay to go ahead and allow viewing by anyone -- it makes it much easier on the editor (and the rest of their team) to get the post prepped for publishing. You don’t need to gush all over the place to get accepted as a guest blogger. That won’t make editors any more likely to accept your guest submission. At worst, it will make them throw up a little bit in their mouths. People can see straight through flattery. They already know how awesome their site is. They care about making it better. If your article or your reputation can accomplish that, then you’re in. Cut the fluff, and make your request. 12) Don’t make a single mistake. Unless your name is Elon Musk, Warren Buffett, or Abraham Lincoln, then your reputation probably won’t be enough to overcome errors. Editors don’t want to deal with errors. They want publication-ready, pristine content. Any published author probably has war stories of how many times they were rejected before they finally got their book published. It can be like that with guest blogging, too. Using the formula above, you’ll vastly improve your chances of getting accepted, but you will never hit a 100% acceptance rate. Form relationships; don’t just throw them content. Site owners can totally tell if you’re just attempting to build backlinks. You need to be different. Your first goal is not to get backlinks -- it's to deliver high-quality content. As you do this consistently and carefully, try to build a relationship with the guest owners. Consistency. Be sure to submit on a regular basis. Once a site finds a great writer, they try to work with them on a regular basis. Be a writer they can rely on. Responsiveness. Even if you are a great writer, editors will often ask for revisions to your article. Don’t take this personally. Every site has a unique set of guidelines, and they simply want to make sure that your particular piece of content upholds those standards. When asked for revisions, do your best to respond quickly and completely with their requests. Correspondence. Go above and beyond, and stay in touch with editors, site owners, and webmasters at the site. The stronger relationship you build with them, the greater your likelihood of maintaining your position as a valued contributor. If you plan on doing a lot of guest blogging, you’re going to need some help. Guest blogging can get complicated, with all the different site editors, tracking submission deadlines, and a variety of guidelines for each site. Managing it all by yourself can get a little bit hairy. The last thing you want to do is miss deadlines or violate editorial guidelines. You may want to hire a virtual assistant or an editor (or at the very least, set up a bunch of recurring reminders for yourself). The more you guest blog, the more you’ll guest blog. Guest blogging is like money. The more you have, the more you can make. Once you land a spot as a contributor for, say, Mashable, it’s pretty easy to secure a guest blogging position with other sites. When your list of guest sites glistens with a high profile site, you’ll be able to get people’s attention and score more sites. But in order to get to that point, you need to start small, and then build up. Guest blogging is not easy. But it’s worth it. I expend a lot of time, effort, and resources to do guest blogging. I’ve discovered huge upsides, and I know you can do the same. Do you have any guest blogging proposal success or mistakes?